As befits the season, this will be a big weekend for musical events in Brooklyn Heights. 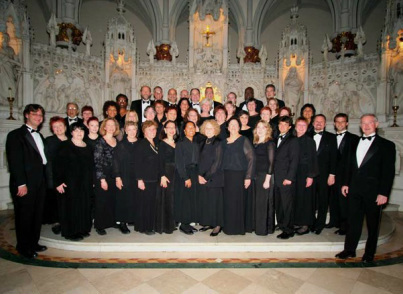 On Saturday evening, December 15, the Brooklyn Philharmonia Chorus (photo) will present their Winter Concert at First Presbyterian Church, 124 Henry Street (near Clark) starting at 5:30 p.m. The program includes Puccini’s “Gloria” (from Messa di Gloria), John Rutter’s “When Icicles Hang,” Renaissance songs suitable for Christmas, Hanukkah songs, and more. Tickets are $20 in advance; $25 at the door. To purchase in advance, e-mail brooklynpchorus@yahoo.com or call 718-907-0963. Also on Saturday evening, starting at 7:00, the Grix Brass Quintet will present a concert of seasonal music at St. Charles Borromeo Church, 21 Sidney Place. Tickets are $10, and may be purchased at the door. More details are in Francesca Norsen’s Eagle article here. As we previously reported in the Bugle, on Sunday afternoon starting at 3:00, Bach in the Heights will present selections from J.S. Bach’s Christmas Oratorio at Zion German Evangelical Lutheran Church, 125 Henry Street (between Clark and Pierrepont). Tickets are $10. For reservations e-mail bachintheheights@yahoo.com or call 718-935-1832. Bargemusic, at Fulton Ferry Pier, foot of Old Fulton Street, has concerts Saturday evening and Sunday afternoon, as well as a free family oriented “Music in Motion” concert Saturday afternoon. Details are here. If you’re up for a walk, on Saturday afternoon the Brooklyn Historical Society, 128 Pierrepont Street (corner of Clinton), in conjunction with Big Onion, is once again presenting a walking tour of historic Brooklyn Heights. The tour begins at 1:00 p.m.; meet at the Borough Hall steps facing Cadman Plaza, and ends at BHS, where you get a tour of the historic building and free museum admission. The tour costs $18 for adults, $15 for students, seniors, and BHS members. More details here. Brooklyn Heights Cinema, 70 Henry Street (corner of Orange) will have screenings of Anna Karenina and Hitchcock, a love story about the famous director and his wife, revealing her role in the creation of the classic thriller Psycho. Showtimes are here.